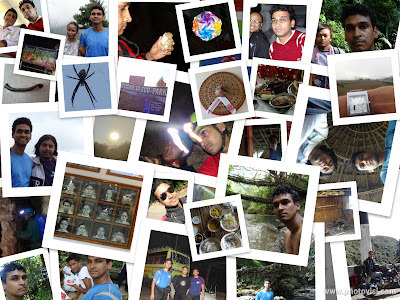 This blog is about my Nine days bike trip in Hills and valley of Meghalaya. Well this travelogue is basically of Meghalaya, but since the story didn’t start as intended so my first paragraph ought to be for the hard work and plannings we did for our intended trip. Somewhere around August’2011, my friend Rishikalpa called me up and expressed his plans for a bike trip to Arunachal Pradesh. Since I had plans for Leh-Ladhak bike trip, so my reply was positive, thinking it would be a dress rehearsal before hitting for the real one. Since Arunachal can give a similar environment like that of Leh. After planning and re-planning for weeks, the route which we decided was Guwahati èNaogoanè Tezpur è Bomdila è Bhalukpong è sela pass è Tawang è Bumla pass è Tawang è Bhalukpong è Itanagar è Phasighat è mechuka valley è phasighat Dibrughar from where we would catch our return flight. Since we were coming from a distance of more than 3000km (Bangalore to Arunachal Pradesh), and with no help from Trip Organizer, we should keep our plans on the run, meaning we might skip some places and need to drive at night if required. Approx we plan to travel 700 to 900 km in our trip. I was in office and tired because I stayed late in Office in last two days and some last minute shopping. But wish to complete my task before I leave for my vacation. Despite being tired and tense about the arduous bike trip ahead I was more excited about the trip. The very fact that it is going to be my first long bike trip makes the trip more adventurous. I can’t stop imagining myself cruising my bike in lonely road which is surrounded by Snow Mountains. This trip is bigger in many facets, be it in distance, luxury or hectic. My highest drive was in Orissa from Bhubaneswar to Gopalpur forth and back, travelling a distance of more than 350km in a single day. Bad news struck me that due to Durga Puja Holidays, there will be some delay in Kolkata region and there will be holiday on 6th Oct in Guwahati for the occasion of Vijay Dashmi. Myself and Rishi needed to take some quick decisions once we knew about 6th Oct Holiday. Since Rishi was in Kolkata he decided to stay with his parent in that festive season and I thought to meet my old friend who lives in Shillong, since it was for three long years we last met. I left Office around 3pm and went home to pick my luggage. After changing two buses and one taxi I reached Airport around 5pm. Since my flight was at 20:20, I got time to call my sister, friends and my Meghalaya friend, Kari. In August itself I invited Kari to join the trip, but due to his leave shortage he was unable to join us. So, when I called him, it was not hard for me to explain him about the trip and the delay in starting the trip on 6th October. He readily invited me to Shillong and asked me to call him once I reach Guwahati next morning. I catch my Jet Airways Flight and reached Kolkata around 22:40. I needed to catch the next schedule flight to Guwahati at 6:20. I went outside the airport to have my dinner and came back around 23:30. I saw that many of my co passengers are of North-eastern descendants were trying to make themselves comfortable in their seats. It didn’t take me long to understand that they too were going to the same destination. After seeing them I too search for a comfortable place. Fortunately, I got one bench of three seats, whose armrest was not present, giving me a full length bed to sleep. Though it was bit slant which was giving me disturb sleep, but at least I could stretch my legs to full. When I saw around I saw families and couples trying to cover each other with one shawl and trying to sleep in sitting posture, another big family were keeping themselves awake in order to watch out for their luggage and their little kids, then I thanked God for my bachelorhood and sleptJ. Sleeping in a tilted position gave my back some problems and I had a disturbed sleep, but it was good in comparison to no sleep. I woke up around 5 am and head to check-in and boarded my flight at 6.20am. I was lucky enough to get a window seat, with no one in the middle seat and only a person of mid 30s was sitting at the aisle end seat. Some two week back, when I went to give my “IBM DB2 Certification” in Prometric center in Brigade Road in Bangalore, I happen to notice “Government of India, Tourism Ministry”. Initially I was reluctant to go inside; thinking it for foreign tourist and Govt people won’t entertain local guys. But then I remember one DTH company latest advertisement punch line, “ Poochane mai kya jaata hai “ ( what harm in asking ). I went there and to my amazement they were extraordinary gentle and kind, I intend to ask some information about Inner Line Permit for Arunachal Pradesh, but instead was being given three items, one book of North Eastern states Incredible India, North eastern map and a book on ‘Adventure tourism’ in India and moreover they were all free of cost. In just a few minutes I was feeling proud of India Government at least ‘India Tourism Ministry’. So when I comforted myself in the window seat, I open that very ‘North Eastern’ guide book, which I got from Tourism Ministry. It really feels good to see the beauty of unexplored land. Actually Tourism ministry of India consider Whole North east as one tourist destination. The eight North Eastern states are generally referred as ‘Seven sisters and one Brother’. Seven sisters are Assam, Arunachal Pradesh, Nagaland, Manipur, Mizoram, Tripura and Meghalaya. And their brother is Sikkim. When I was going through the book, I thought to better talk to the person sitting beside me, as my previous experience suggests that talking to local people will give you more information about the local History and in a more detailed way, which a book can never give. So I initiated the talk, he introduced himself as Rajiv Sharma and he too was coming from Bangalore and took the same flight, and after reaching Guwahati, he needed to catch his third flight after an hour to Imphal. His fore father settled in Manipur centuries back. After telling about Manipur and neighbouring states he told that one of his hobby is travelling. And with his decent salary he had already traveled dozens of countries in Asia, Australia and Europe. Just a small talk with him for about half an hour gave me the new dream. All of a sudden I realize that travelling is not expensive if you manage your money properly. Our talk was cut short with the announcement of our arrival at Guwahati airport, I quickly took his email ID and bid him wishes for rest of his journey. After coming out from ‘Lokpriya Gopinath Bordoloi International Airport’, I called up Kari. He told me to take a taxi for Shillong. I got a shared taxi with a newly wedded Bengali couple. They came to spend the long weekend in Cherrapunji. They occupy the back seat and I got my favourite front window seat. Listening to Assamese FM Radio, I tried to start the conversation with him by asking about Guwahati history; I read in Wikipedia, that somehow Guwahati is related to Mahabharata.He knows about the history but was unable to recall the facts. He was a nice guy but less knowledge about Assam history, (ya right I should not expect more from a driver), anyway at least he was responsive. After crossing into Meghalaya, he told the Petrol is cheaper in Meghalaya some 68Rs per Litre compare to 74Rs in Bangalore. On our way, we stopped in ‘Zen Hotel’ for breakfast. It is a decent North Indian Hotel, with north Indian snack and good tea. While I was waiting for my breakfast, I saw one family sitting in front of me bowed down to say Grace which reminds me to do the sameJ. It did not take me long to realize that we are in Meghalaya. We can see girls, as small as toddler, in their tradition dress, Jainsem. We can easily make out Khasi women by their cloths, Jainsem and their red lips which happen by eating kwai (paan/betel leave). When we crossed Nongpoh village, we saw mostly ladies were in command in shops. To this the driver chuckle and said, Khasi man are very lucky, they just need to marry Khasi women and then they will get drunk and sleep all their life. All the work will be done by his wife. He was actually referring to matriarch system, which is followed in Meghalaya, but what driver had told and many other misconceptions were soon going to get over in my coming days. We reached Shillong around 11am which was quite astonishing for Kari that we took only two and a half hour from Guwahati. He later told since it was Vijay Dasmi, we were able to reach early, otherwise Guwahati –Shillong road usually has traffic jam because it is only two lane road, and due to Road widening project in some stretch its restricted to one lane only. I waited for Kari in Shillong main market, Police Bazaar, he came and we went to his home. It was a different feeling to enter his home, since it was mix of wooden and cement, which was giving me the look of a resort. Every step I took on the wooden floor and the wooden sound which comes out was totally soothing to my ears, and why it should not be for a guy who has never lived in wooden home. I met his mom and dad they were extraordinary hospitable, only initially problem I faced due to Kari forgetfulness of not telling his parents that I am going to stay with them, so which means aunty got to know my plans to staying at their home, from our initial conversation J can you imagine that??. I hate you lazy Kari :P.
Aunty suggested Kari to take me for sightseeing since it was a holiday for him. But I didn’t want to burden him, since I was already a forced guest J also I thought I could catch up with some sleep which I had not taken for the past two days. But on second thought I too didn’t want to lose the opportunity to do some sightseeing in Meghalaya before leaving for Arunachal Pradesh. So after a good lunch we all set to explore bit of Meghalaya. Added advantage was Kari’s 6 year old niece came to their house so aunty also joined us. Shillong is the highest populated hill station in India and have second highest car to person ratio in the country making her road to have high density traffic. And since it is a hill station the roads are not much broaden and somewhere they are mere one lane only. Good thing about Shillong is that people understand the problem and they follow ant-like approach to follow the car ahead of them, unlike in other parts of India, where people try to overtake each other even in Traffic Jam. It took us bit long to go out from the city, but once we were in outskirt, it was just pleasant view to see around, you can see all the shades of yellow and green once you reach outskirt. Aunty and Kari were too kind to me for telling me about the nitty-gritty of the place. Aunty works in Secretariat as an officer, which in itself tells about her stature and she was so humble that you can’t stop thanking God that I was around with them. On the way we saw hills which have only grass unlike the hill which are populated with thick vegetation. It cannot be possible that people will clear the hill for fun to make it look beautiful nor for agriculture purpose since there was no sign of terrace farming as far as I was able to see. Kari told that this is one of the reasons Meghalaya is called as ‘Scotland of East’, similar to Scotland, here also we can see landscape like plain grass and not thick vegetation. Actually the soil on those hills are not much in depth, so when the plants grow and try to expand their roots, they are not able to grasp the soil and as a result it does not grow in length and wither away. Only the grass, which required less roots flourish in those hill. Although it does not mean that in Meghalaya you do not find thick vegetated populated hills, but frequently you will come across Scotland type of beautiful hill. Our first stop was ‘Duwan Sing Syiem’ view point which is about 23 KM from Shillong. The last turn which we took for viewpoint, makes Kari to sigh in despair. Actually on our way to the viewpoint the weather was sunny and the sky was clear but only in that turn everything changed and all of a sudden we found ourselves in thick fog. Once we got down from car I got to know the gravity of Kari’s desperation. From the View point we can see Mawkdok Dympep Valley which extends all the way to Cherrapunji. Kari said it is a good view, but now there is nothing left to regret, moreover I was thankful that what I first heard in my school text book, finally got to be near that place. Although I didn’t touch the place but I was near to Cherrapunji. We took some snaps and headed back to Shillong, on the way the sky was again clear and sunny. We went to Elephant Fall. There were two ways to see the fall, one is from the top and other is from the bottom. Interestingly, both were not connected, so if you want to see the fall from both sides you need to purchase two tickets. Two ticket systems is in the place because entry from both sides is manage by two different villages. So they charge the money from both end to maintain the cleanliness. If you come from top you can see all three falls. But if you come from bottom gate, you will be able to see only the third fall. But the good thing about bottom gate is that you can relax because there is plenty of space to sit, roam and run and also you don’t need to climb stairs up and down. When we were entering, we saw there was some photo shoot taking place. Kari told the models were actually the contestants of the ongoing Miss Shillong Contest which later held on 8th of October. Well I had a mixed feeling by hearing itJ, first I was sad because I was missing some of my best friends but on second thought I was happy that I can make them jealous. But as we all know good thing don’t last for long time and same was with Elephant Fall (what? you were expecting another word :P), after having chicken chowmein we headed home. It was dark when we reach home, we chatted for a while and I transferred snaps which I took so far, to Kari’s laptop. I want to sleep early since I need to wake up early, but I got some hint, that the dinner was not yet prepared, so I thought to skip it and sleep. By this decision, Kari was bit amazed which was obvious, because he told it was only 7 p.m. and how can I sleep so early, I was clueless, it seems to me that it was already 10 p.m. Then I remember that it is my first night in North East, where the sun rises early and sets early. After knowing the correct timing I thought it was waste to sleep so early. By the way, isn’t it funny that Bangladesh which is 30 min ahead of India time is sandwich between North East and rest of India, which follows same time zone throughout India? Anyway by then they got guest and aunty and uncle went to attend them, Kari and me left in the living room and we had our old good time together which we use to have when we were in Bhubaneswar. When we were chatting News flashed on News channel that Steve Job died after a prolong disease, News was not a shock since everyone knew about his series of disease and making Tim Cook as the new CEO of Apple. I got to know about him first, when I was in my third year engineering and read his famous speech at Stanford University, ‘Stay Hungry, Stay Foolish’. Before that article I know him just like a G.K. question but after reading his speech I became his fan. Few weeks later, one of the Facebook’s ‘Status’ says, finally Steve Job arrived in heaven and from now on Angels will be called as ‘iTems’. Anyway, coming back to Kari’s living room, our conversation went to Khasi matriarch system oops it is not Matriarch system but matrilineal system. Well for many people this would be the first time they are hearing this word, ‘M-A-T-R-I-L-I-N-E-A-L'. NO!!! , anyway atleast for me it was first time. Matriarch society is the one where a woman rules or dominates a family, group or state, whereas in a matrilineal society, the descent or the family name is through the mother's side or linage; all children take the family name of their mother. Therefore in matrilineal society, it is not that women are in authority and men are suppressed or have no responsibility. But in fact in this society both the gender have equal rights and can raise their voice as it happens in other society. Khasi society has everything opposite what happen in other part of India, perhaps world. In Khasi society, daughters inherit from her parents unlike the son and not the elder daughter, but the youngest one, as for her elder sisters, they will settle with their husband in their new home and her elder brother will either settle with their wife in their new home or if they marry the youngest daughter, then he will settle in his wife ancestor home. Now there are some practical questions, whom we think will take proper care of our parents, our wife or our sister? Definitely it would be our mother’s daughter then her daughter-in-law. Matrilineal society is following the same things from generations. In Meghalaya, you will find many women are bread earner for their family along with their husband. In fact they can do a hard job which goes parallel with men’s work. On my way to Shillong in a village, ‘Nogpoh’. I saw a butcher shop which was run by one Khasi lady wearing Jainsem. As both the man and woman work to raise their family, the society is broad minded and is open in their approach toward new things. Someone said that if you want to know the progress of the society, you need to see how the toilets being maintain and how they treat their women. While in some part of India where girl child are murdered in mother’s womb, in Meghalaya, it is a time of celebration on the birth of every girl baby and hence there is lots of respect for women in matrilineal society. And as far as toilets are concern, rest of India will not hesitate to go to the loo in open space. But you need to do the same at your own risk in North-east. family properties and assets. In matrilineal society, the man will only become the chief of the clan and not the women. Women are the care taker of the family. In gist, the matrilineal society treats both the gender equally and gives them equal responsibility. Well in our talk we forgot to keep track of time, so when we realized it was 10 p.m. we thought its better to skip the discussion and moved to dinner table. After having tradition meal, I went to bed, hoping and dreaming for good day ahead, without realizing how things will turn. Woke up at 5.00 a.m. by my mobile alarm, the sky was clear and it was not total dark outside. Around 5:30, Kari and I were heading towards Taxi stand on his car. I never knew when Kari took the detour to the golf course, which he wanted me to see as the last tourist spot before leaving Meghalaya. Well I never followed golf before, so I don’t think I will be the right person to talk about it. But what I remember from Kari’s words, that it is a natural golf course having the advantage of Scotland-sort of plains hills. Initially British Officers constructed this 9-holes course which later on converted to 18 holes golf course situated in an undulating valley covered with pine and rhododendron trees. Walking on the dawn’s dew-grass and feeling the breeze, was an experience in itself. Then we moved to Police Bazaar, there I took a shared taxi to Guwahati at 250 Rs. You can also get frequent Sumo which runs in same route and it charge 150 Rs per head. Life is like a journey, which have its beginning and an end. And in between beginning and end, lies ups and downs, which makes life both bitter and enjoyable. I was soon going to face the bitter part of my journey, will try to keep this frustrated part concise. Enjoying the scenic beauty, I reached ‘6th Mile’, and went to the warehouse, from where I needed to collect my bike. And to my horror my bike has not reached, even though I sent it on 18th Sept 2011, 18 days ahead. I got a call from Rishi, my other bike partner, that he reached Guwahati at 7am and collected his bike from his movers and packers. I thought that I will ask him to go ahead with our actual plan and I will visit some tourist spot with Buses or train till nearby cities like Tezpur. Actually I didn’t want to ruin his trip because of my problem. But when we met he suggested that instead of going to Arunachal Pradesh, we should go to Meghalaya in his bike. I was initially reluctant, but when he told that he even can’t go all alone and drive in Arunachal Pradesh dangerous valley, I agreed with him, because then the guilt of changing all the trip plans won’t come all upon me, atleast to some extent. We booked a room in ‘Brahmaputra Lodge’ in six mile square. It is a decent lodge. We both were pretty tired so we had our lunch and went for afternoon siesta. We woke up around 6 p.m. and decided to go to local market. After enquiring with Lodge’s receptionist, we headed to ‘Paltan Bazaar’ in Rishi’s bike. Paltan Bazaar was a decent market, which is similar to many other north India markets. We saw one Internet cafe and went inside to surf in order to re-plan our journey itinerary. Since Rishi has skill of planning journey and I was still frustrated about my shattered dreams, I did not interfere in his planning. After one hour we came out and thought to have a local taste, and went inside one Manipuri Restaurant, ‘Sangai Manipuri rice Hotel’. We asked for menu, but they told that they don’t have Menu. We are still in surprised mood and in dilemma that did the owner understand our language. In mean while the waiter brought us the two plate meal. When we about to start, he brought a big tray, which have six dishes, consisting of Pork, beef, etc. By now we understood that the meal is compulsory, and other things are add on. It was pretty cheap. Meal costs 50/- per head and non-vegetarian item are also in normal range. After coming back to Lodge, I took bath, since Guwahati was bit humid. We then put our essential clothes is one bag each, since now we no longer need all woollen clothes which we brought for Arunachal winter. We planned to keep the other bag in Hotel itself, which we can collect once we come back to Guwahati. My Mover and packer told that the bike will come by Monday or Tuesday, so we thought to visit Meghalaya in mean time and then we will come back to Guwahati and head to Tawang with my bike. So early morning we woke up, checkout our room, put our extra baggage at counter requesting to keep it till we come back and head towards Shillong. Since I have already been there two days back, I was doing the job of a Guide, sitting pillion on Rishi’s bike. There was mild frustration within me so I sat without any emotion. The journey seems like déjà vu, only different was, that now we can stop at our own will. Since I know the rate difference of Petrol, I asked Rishi to fill petrol only when we reach Meghalaya border. We filled Petrol worth 500/-. After Petrol Pump our next stop was one small Tea stall, where we had tea and some biscuits for breakfast. We then stop at Orchid Resort in Umiam Lake, also known as Barapani (Big Water) in local language, it is 15km from Shillong and also very near to Shillong Airport. Umiam Lake is the largest man-made lake. We planned to do some water sport activities but halting there was not worth at all, since they all have common water activities like riding boat, or speed boat, which can be done in any other part of the country. So after taking some snap of the beautiful lake, we resume our journey towards Shillong. By the way other sport activities also held in the lake, but only in some specific season or festival. We reached Shillong around 12pm and had samosa in one triangular shaped restaurant in Police Bazaar circle, and discussed our later plans. We planned to go directly to Cherrapunji by night and roam out there the next two days and can be back to Guwahati by Monday. When we started we asked one pedestrian for direction to Cherrapunji, after giving direction he suggested it was too late to go there, since it was already 1 p.m. and hence it will soon be dark. But we thought lets give a try, might be that elderly person was too cautious and moreover we came in adventure tripJ. On our way to Cherrapunji, we saw one Board on sideways of road which says, ‘Way to Shillong Peak’, not giving much thought we decided to go there since it was on the way and one of the tourists spot. After travelling uphill for some 15 min we thought that our decision was wrong, but still we were quite positive and thought might be we already come 75% and only some distance left, so we continue our drive. After some 10 min we reached the main gate to find that the Shillong peak is actually inside Army premises. Now another problem arised, since it in under Army premises, they are not allowing us to go without helmet for pillion driver. Remember my helmet was somewhere in Jamshedpur – Kolkata way along with my bike L. Since we already came a long way, we decided to walk till Shillong peak. So after walking a well maintained, discipline and scenic beauty for 30 minutes we finally reached Shillong peak. Shillong peak is the highest point in the State, more than 6000ft above sea level. People say in evening the view is awesome because of city lights which seems like a star-studded abyss. You can dress yourself in Khasi clothes and buy some souvenir. In the nearby display green-board, ‘Lum Shyllong’ was mentioned, which is the dwelling place of ‘Lei Shyllong’ a Goddess, after whom the name was derived. We spend some 20 min in the spot and then return back by walk of 30 min where we parked our bike. After spending close to two hours in Shillong peak, it become obvious, that we should not try something heroic (read foolish) to travel to Cherrapunji, which is 58 km from Shillong as it was already around 2.30 p.m. I suggested that we should better see ‘Elephant Fall’ which is near to Shillong Peak and then spend our night in Shillong itself. Well as I already told before that Elephant Fall have two ways of entry and I visited through lower gate along with Kari and his family. This time I got opportunity to go by upper gate and see all the three falls from near. Well I didn’t mention last time that why the fall is called ‘Elephant fall’. Actually originally Khasi people named it, ‘Ka Kshaid Lai Pateng Khohsiew’ (Three Steps waterfalls) because of obvious reason. But when British people came they named it ‘Elephant Falls’ (might be because they are not use to of long name for waterfall J) because on the left side of the falls there was a Rock which resembled the elephant but it was later destroyed by an earthquake of 1897. We were done with the waterfall by 3.45 pm, and now headed towards Shillong. We reached Police Bazaar, and made several unsuccessful attempts for a lodge. Since it was holiday season plus Police Bazaar is the main commercial centre of Shillong, things were getting difficult for us. I then called Kari and he suggested to try our luck in ‘Laitumkhrah’, which is another good locality. After some 20 min drive (because of some detour) we reached Laitumkhrah, and found one descent Lodge, Prakash. Nearby, there was a famous restaurant which is named after Khasi dish, ‘Jadoh’. We were already late for lunch; however small quantity of meal was left for us which were sufficient for us to quench our hunger. After having some pork and dal with rice we went back to Lodge and relaxed for some time only after coming out for dinner in one Chinese restaurant in Police Bazaar. On our way back, we saw a beautiful Catholic Church, ‘Mary mother help of Christians’, which is in Laitumkhrah main road. Finally we came back to lodge and slept. The day was hectic and not much rewarding as far as the tourist spots were concern. And throughout the day I was repeating one thing in remorse, ‘Jaana tha ruus, Pahuch gaye cheen’L (It is a Hindi idioms, which means, ‘wanted to go to Russia, but reached China’. And moreover till now I didn’t drive the bike even though I spent few thousands on it. twenty minute. Though I consider him a lazy guy, but that sunday morning when 99% of Indian make excuse of sunday and sleep a little extra, he woke up early and came all the way to our Hotel, even before we woke up, to guide us for a better trip. Around 9 a.m. we had to start for Cherrapunji, so we three had breakfast in one north-India Halwayi Shop nearby and then left for Cherrapunji. Our first stop was ‘Duwan Sing Syiem’ View point, which I already visited with Kari and his family. But the day was different since I was in full bike gear, it was time to take snap in front of bridge. The climate was sunny and therefore we could see the Mawkdok Dympep valley clearly, without any problem of fog, unlike the problem we faced last time when I came with Kari. Cherrapunji is 58 km from Shillong and the view point is 35 km from Shillong. Rishi gave me his bike for the remaining ride to Cherrapunji. So for complete 23 km I rode the bike, but sadly it was not mine. We reached Cherrapunji around 11.30 a.m. Last night we tried calling many lodges for vacancy, but as usual all were reserved due to peak holiday season. We then got lucky at one lodge ‘Sohra Plaza’ where the person told, that if we can come before 12 a.m. he will cancel the previous booked reservation for us. We were lucky enough to reach on time. ‘Sohra Plaza’ is bit old sort of lodge and costs 600 per day for two beds, but for bachelor it is manageable for spending night. Other advantage is that it is situated Sohra market, main market of Cherrapunji. By the way, forget to tell that Cherrapunji official name is Sohra. After check-in the lodge, we headed toward Cherrapunji Holiday Resort, which Kari told run by one Tamilian, who left his Bank Manager job to become a full time Resort Owner. There we could also visit some points. Cherrapunji Holiday Resort was in village Laitkynsew, from where Bangladesh is visible. India-Bangladesh border is actually divided naturally by Cherrapunji. Cherrapunji is situated in high plateau, and the Bangladesh is in plain. When we reached Cherrapunji Holiday Resort, it was post lunch and one family was eating lunch in the hall. We asked the attendee about the owner. She told he was busy having lunch, we then enquired about the ‘Living root bridge’, she replied in negative stating that it is already late to start for ‘living root bridge’. We were like, “WHAT? ?” it is still pretty sunny out there, but she was pretty adamant in her tone since she was the local lady from the nearby village. Anyhow, we thought to ignore her advice and wait for the owner to come, in mean time we had our lunch. We ordered for Chicken Jadoh stem, pork Jadoh stem and chicken Neuong boneless, a gravy curry. We had full stomach with that yummy tasty Khasi tradition meal. In between our meal, we got to know that the family who was eating their lunch was actually the owner’s family. His name is Denis Rayen. He came to us and sat along with us, and asked about our where abouts. Truly, we were impressed by his kind gesture. He then told that why it is difficult to go to the ‘Living root bridge’ now. He told it was almost noon and by the time we will return it will be pitch dark (remember sun sets early in Northeast), since it is deep inside the jungle with no electricity and hence risky and people usually need a day to visit it. But he also told that it is not that difficult to travel those hilly three km, in fact he himself went and came back within two hour, provided we spend less time in the ‘Living root bridge’. Since we don’t have much time for Cherrapunji, we decided we should rather finish this point than wasting the day, doing nothing. On our request he called one guide for us. We had our lunch and in mean time Denis gave us one map which shows four-five tourists point on our trek. We had our lunch by 1 p.m. and in mean time the guide already arrived with one bag. He was in normal slippers and simple clothes. We headed to Mawshanok village without wasting time. We reached the village in about 10 min ride from resort. We parked our bike in the entrance of the village. The village was situated in a hill and we need to travel downhill. I thank God because there was well-paved cemented stairs. It was Sunday, so we can hear the Khasi hymnal (which are in same tune with the English hymnals ) which were coming from a nearby Church. Our guide told that the Sunday worship was for the whole day and it will end at 10 p.m. As we were descending the music fades away, which later substitute with the music from insect, wind and water rowing and somewhere bird chirping. After travelling some 20 min we started feeling the heat. We both had jacket which we forget to put in the Resort. I was feeling more tiredsome because I have a heavy biker jacket, waist bag and binoculars. I tied the jacket on my waist but it keep on drifting down on every step I took further. Also the cemented stairs are not continuous and somewhere stairs were made up with big rocks which at times were slippery. On our way we found two groups, each after an interval of 15 min. Both the groups were ascending back to starting point. One of the groups did not even complete the whole trek and didn’t reach the ‘Double Decker Bridge’ which is the gem of the trek. The second group told that we had only travel the 40% of the trek, when we were assuming we had travelled some 700-800 stairs. When we reached the bottom of the valley we found ourselves in the village. We saw two living-root bridges, and then we crossed the river by two steel bridges, which were constructed by Indian Government. By the way, I am not describing about how the living-root bridge came up because you may find better on internet with much better explanation. After crossing two steel Bridges, it was a time to ascend to the hill towards a village, Nongriat. Now we started realizing that our stamina was not worth to go to this sort of trek, those stairs are not very comfortable to climb, and in some part, the steps were having an inclination of about 60 degree. I was feeling more tired because of the binocular and heavy jacket, and was the last person among the three of us. In fact I tried climbing like animal by trying to walk using both my hands and legs, and it did help, but only till your spine don’t start aching. We soon found out that the Guide was carrying water bottles in his bag, the thing which we needed the most at that time. The Guide’s name was Khador, ‘Kh’ with the epiglottis, he was a college fresher and came to village for his Durga Puja vacation. Well Denis had already told us that the guide will not be a professional guide, and he can just route us to and back from the double-decker bridge. But since we need to see the living-root bridge, we took our chances. Finally after 2 hours we reached the Double-decker Bridge. We took our shirts off and relaxed there for some time, and let our shirt get dry. I was missing my swimming gear and my friends with whom I went to my previous trips. We need to go back, so I did not try to take a plunge either. We could have gone bit 10 min further to see the natural swimming pool, but since there was no question of taking bath, we ignore the idea and headed back to Resort after relaxing for some 20 min. Till descending everything was normal, but again thing got worsen when we need to ascend to our starting point Mawshanok village. I was all the more tired this time. I then made one rule that I will take 2 min rest after travelling 100 steps (which in time reduce to 70 steps). I repeated it some 15-17 times. I was just waiting for the sound of music to disturb my eardrum. And well the Church Hymnals did come to rescue once again J though it was in difference sense. And finally we reached the top to Mawshanok village. Total time we took was some minutes less than 4 hour and we travelled close to some 9,000 steps back and forth. In which, we saw four living root bridge, two steel Bridges and one ‘Double Decker Bridge’, and we missed the natural Swimming pool. Denis later told that villagers are planning to extend the double-decker bridge into triple Decker–bridge. Hope my generations to come may go and see that againJ. If you want to trek the Double-decker Bridge, best time is to start early and come by noon, but if you want to enjoy, come for two days atleast, you can also spend a night in a small guest-house near Double-decker Bridge. We three took the bike and came to the resort. Other hotelier were preparing for bonfire when we reached the resort. Sun was already setting but we can still see the crimson colour in sky. We had tea and got ourselves comfortable in bamboo chairs. Down the valley we can see the lighted village in the Bangladesh’s plain. After some time Denis uncle took time for us from his chores and cared enough to have a light chat with us, even though we were not living in his resort. You will always be in awe of people who not only dreamed but dare to make their dream come true. And Denis Rayen was one such type of person. It was already late so we started our journey to our Hotel in Sohra. Moon was nearly full and sky was clean giving us a soothing feeling of beautiful night. On our return, we stop at Saitsohpen Junction, and had a good north Indian meal at ‘Avron Restaurant’. Kari had told us in Shillong that this restaurant serves good food with best Roti, which are unlikely to get even in Bangalore. After taking our dinner we went to our hotel and slept. One good thing about Rishi is that he is a freak-out tourist, which I find in many of my Bengali friends. When we knew about my bike mischief, instead of wasting time and regretting he took the opportunity to do other adventure. He heard from before that in India, caving is done in Meghalaya. As for me, I was frustrated on my Mover and Packers and for that then lost interest on the trip. I was just swimming along with the course of the river. Rishi had already made some calls to the person, Gregory, who conducts caving in Meghalaya. And we need to start our caving from 9 a.m. As usual I woke early than Rishi and relaxed myself with early sun and morning newspaper. Khasi language doesn’t have their own script therefore they use Roman script to write, which make Khasi readable even to those who don’t understand it. one. When we were having breakfast he introduced himself to us, his name was something in Khasi which I don’t remember, since he told that people use to call him with his nickname, ‘Men’, which was quite easy to remember. While talking we got to know that he was about to complete his graduation. He does Caving as a part time job and hobby. He had also done some rock climbing course from Darjeeling. I asked him how the caving will be, in parameter of both physical strength and time needed to complete. To make the question easy for him, I asked him to put ‘Double-decker’ trek as pivot, and then tell us how it will be, in both parameter. To my relief he told comparing ‘Double-decker’, it will be easier, only difficulty was that we need to be more cautious from the sharp edges of rocks and slippery floor. After having breakfast we three headed to the suburb of ‘Mawmluh Cherra Cement Ltd ‘(MCCL). It is a state government run Cement factory located 7.8 Km from Sohra market. We parked the bike near one house and ask the owner to take care of bike till we come back. Passing one small brook, we followed Men to the back side hill behind MCCL factory and then descended to one opening in the rock. Men then gave us the equipment for caving like ‘Dry Cave Suit’, ‘Helmet’ in which headlights were attached with, and cave bags, in which we put our clothes, mobiles, water bottle and cameras. ‘Dry fruits’ which we brought along with us, we kept it in our cave jacket. We made sure to put camera and water bottle in small cave bag, which could be readily open when need arise. Men also gave us a short ‘Knowledge transfer’ for how to use headlight of the helmet, which included which button need to be press to scatter light and the focus light. Also how to send emergency signal if someone got stuck inside the cave. longest in India. We three then entered the cave, Men leading from the front, then Rishi then I. Men told that he had seen the black snake in his past excursion, pointing to one corner on the Rock. He also told that the cave is not a dangerous place as most people think, since the cave is very cold from inside because of no sunlight, which makes the condition worse for creatures to survive. Though you could find snake on the entrance of the cave. Men was taking every precautious step on our way, He use to stop every time and throw some pebbles on some area, which he thought can be prone for venom snake. The First attraction in the cave was the shining stone, which gives a star like sprinkle when some source of light strike on it. The shining on the stone is due to the layer of Sodium, which is formed on the rock in course of many years. We also saw the ‘Marble rock’ in making, means half stone and half marble. When Men start including term like Stalactites, Stalagmites and Columns, I cannot stop myself reminisce about my School Geography Classes. I had read and seen the picture of all of them before but now I was actually seeing them with my eyes. Before this cave I had been to Borra caves near Vishakhapatnam, in Andhra Pradesh, in Ananthagiri Hill range of Eastern Ghats, but it not at all a challenging experience. Though I had seen the stalactites, stalagmites and Column there also, but then it is more like a museum, but out here the feeling was completly awesome. I was literally doing spelunking for the first time and the dangerous stuff is making things more adventurous. The feeling of being a main character in National Geographic channel ought to be awesome, even if it just a feeling. body in chilled water, we reached a room sort of place, in one corner of that space we could see the spring coming out, which was the source of water. We also saw some scientific equipment placed in some column. Men told that the equipments were put by German scientists who are researching on Caves. On our way, we also saw ‘permanent red mark cross’, which signifies the pivot for the research team, which come to survey the Cave every season. In that room sort of space, Men asked to close our headlights and asked one important question, “What we will do if our headlights turned off due to drainage of battery”. For that we had no answer, then he told that yes we can’t do anything other than to pray and wait for the rescue team to come on time. He then told that one tourists group told that they will follow the stream which flows inside the cave, which is again a very dangerous result, since inside cave, stream appeared from any rock and disappears in other rock. The cave is 4 km long, but most of the routes were risky to go further. 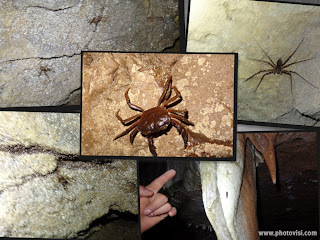 Till now we have come across Cave crickets, Crabs, Leech, Bats and Spider. But now what is waiting for us would be going to remove the ground beneath us. We started coming back from the end of the cave, we can see some polythene attached from the roof of caves. Men told that in spring season when the caves will be full of water, such impurities like polythene, cans, papers etc comes through the opening along with water and something stick to the edges of the rocks. We saw huge lumps of sand while we were returning. Men told it is actually quick sand. He threw some stones on the sand, which after some minutes disappeared from the surface. Men suggested to walk on the sides of the quicksand, where there were some rocks to step over it, Men was leading us and I was behind, suddenly he came back, and was silent for few seconds, in mean while we saw the path from where he retreat, and we saw one beautiful cute snake. It is beautiful because it was green in colour and cute because it was a baby snake. When the light falls on it, its florescent green skin was glowing like radium in night. And since it is a baby snake, it was thin like a pen and approx one adult hand’s length. And if any of this two attribute of the snake would be opposite, I think we would have run amok for our lives. But since it was not adult big-clumsy-thick snake, I got to see two type of adventure person trait that moment. After seeing the snake Men took a moment to find his composure, then he took his camera from the Cave bag and click some picture stating that his friend never believe that he do the dangerous work, and that he often sees snakes in caves. Till that point he was not using his camera and was doing his normal guide work, but after seeing the snake he too became a tourist like us and took his camera for the first time since our visit and took some snaps. So for that very moment we all became Tourist and the cute little green snake was the tourists’ attraction. Men’s second reaction was that he wants to go back from the way we came, as he feared that we might encounter some more snakes. That was pretty obvious reaction any normal man will have at that sort of situation. Moreover he was once bitten by a spider, whose sting’s pain lasted for months. He told he was scared of getting bitten from snake and spider a lot. When we two saw the snake we were overjoyed by encountering a rare thing in a rarest place. If caving is dangerous adventure hobby then seeing a snake without any safety is icing on the cave. Oops cakeJ. Well we both are novice in Herpetology, but we were also not illiterate, courtesy Discovery Channel. For us SNAKE + BLACK = BLACK MAMBA and SNAKE + GREEN = Green VIPER. So we gave that little-beautiful-cute snake a name, i.e. Green Viper. Moreover it is better to boast that we saw a more dangerous Green viper over a snake. So our green viper was decent enough for some time and stayed there for some time to give us the pose. By that time Rishi was at his best and went some four feet near the snake to click its snap, I and Men stayed two steps back from Rishi. I don’t know what was going inside Rishi’s mind, but he started acting like a professional snake charmer. For me I know one thing very clearly, that if the snake decide to play with us, we cannot run faster in his terrain, which consist of quick sand, water and edge rocks. Men then told to go back from where we came, Rishi hearing and fearing that he is going to miss the rest of the cave started pleading to go further. Men’s point was that we might get more snakes ahead, but Rishi’s attitude was, to click more open snake picture. As for me I know that even if Men pretend that he fears snakes and spider bites (which look like a joke if he is in this profession of caving guide), we can’t ignore the fact that he was responsible for two lives, and If something bad happen to either of us, he will be the prime responsible for further enquiry. After staying there for five ten minutes the snake also realized that he was standing in our way, and slowly crawls to the corner of the rock. This gave Rishi extra energy to push further. He kept telling that why we are getting scared of that little snake. Men was adamant in his stand to go back, and I was with Men. For me I consider it is wise to listen to the professional cave guide, who did caving in the same cave a numbers of times, than to trust an adventure desired tourist. We two were trying to make Rishi understand, but (I think) for him it seemed that we are not brave guys. Well “One man mind is other man mystery”. But what Rishi did next made me bit angry. He seeing that we were not budging from our stand, went ahead on the other side of the snake. Now it was our turn to decide, either we too would have gone back or followed Rishi. By this time, Men was aware of the situation. He consulted me what to do, I told I will do whatever his decision will be, for the obvious reason. Men told lets go back from where we came. We turned and started going back, which make Rishi angry with frustration. But he don’t have any other option, he surely cannot continue the journey without the guide, and get lost inside the cave. The cave is like a maze and we have seen many ways already in the cave, which we did not traverse. Rishi, shouted for some time, and trying to persuade us from distant, (might be our little cute snake has a wonderful time out there). But when he saw that we were quite a distance from him, he with tramping down like a little child started coming to us. Then suddenly our little cute green viper’s family came from nowhere. 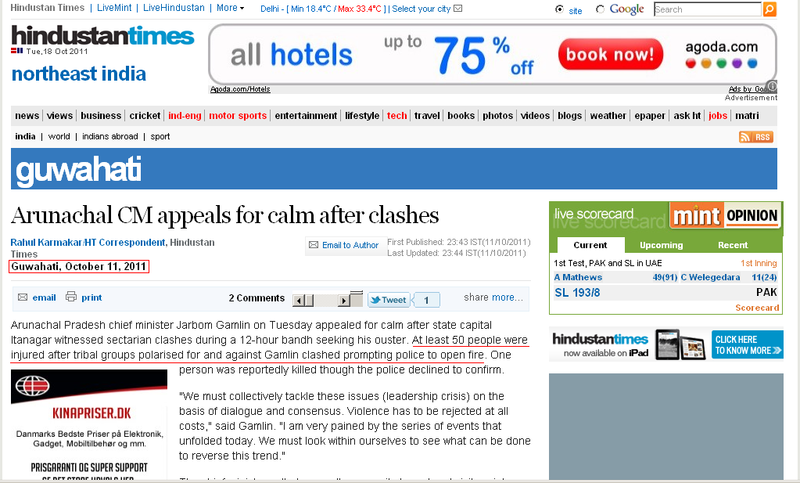 Might be they got disturb with Rishi trampling down of his feet. In no time they started chasing Rishi like an anaconda movie, it was a horrible site, I wished we had not left Rishi back there alone...... But wait a minute; what I told was Men decision?? We climb out of the cave, and started ascending to hill. When we reach the top we could see the MCCL factory from the top. Men told that when he came last time there was greenery throughout the mountain, but we were seeing the dry land and the dust from the truck. Men told that it is because of extraction of lime stone for cement. He also told that it is risky to go from some cave’s opening and vibration also can be felt inside the cave at the time of blasting. I just hope that next time when I come for caving to the same place. I will not see much difference in the greenery of the mountain. We return to brook where we changed our cloths. We dried ourselves and removed the sand from our shoes and put slippers. Then we went to the road, where we kept our bike and rode to Saitsohpen. Men took the taxi to Shillong. His expense was 1900/- for two people. In Saitsohpen we took our lunch in Avron restaurant, where we had our last night dinner. After lunch we went to our room and drop our stuff which we carried with us and then head to ‘Dainthlen Fall’ which is some 5-7 km from Sa-i-Mika Park. We planned to cover ‘Nohkalikai Falls’ which is some 5km from our lodge, but soon it was dark. We came back to lodge and had momos and tea for snack. I regretted for not seeing it, because Kari later told me that it is the fourth highest waterfall in India. The height of Nohkalikai fall is 335m. I called my Mover and packers but they told that my bike will come by Thursday. I then called my friend, to cancel out flight ticket of Dibrughar and book from Guwahati. We had our dinner and slept. We planned to make this day as our last day in Sohra. Rishi has already booked the Vertical Caving, so that means we have to complete remaining Tourist spot in the morning itself, if we are planning to leave Sohra by evening. We woke by 6:30 am and started our journey. 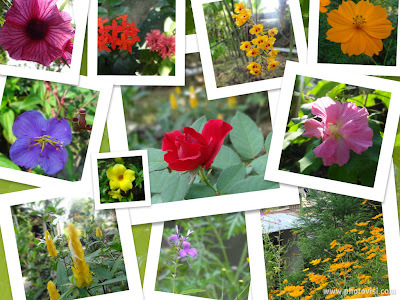 Our first stop was Eco-park, which is 5km from Sohra market. We reached there by 7am, and find it closed. It opening time was 7am, but no one was around to open it, we decide to move to next point rather than waiting for it to open. Around Eco Park, you can find the Scotland like undulating valley. time there also; we just visited the view point where we can see Bangladesh beneath us. We took some snap and moved to our next tourist spot. We then went to ‘Khoh Ramhah’ or ‘Maw Trop’ which is 0.14 km from Thangkharang Park. We can see Bangladesh also from there. It has a legend behind it, there is a Giant natural rock formation resembling a huge upturned conical Khasi Basket. According to the Legend the stone basket belong to the evil giant, which was killed when villager offered him meal mixed with sharp iron and nails. India measuring 305m (1001 ft). Good thing about Kynrem fall is that we were seeing it from below, usually falls can be seen from side or from Top of the cliff, but the Kynrem fall comes from Thangkharang Park and fall in three tiered way. It is located in the highway, so even the commuter cannot miss this tourist spot. We took some snaps and headed back to Sohra, if we would have gone ahead we would have reached Bangladesh village ‘Shella’, which is 23 km from Kynrem fall. While returning we stopped at ‘Mawsmai Cave’. Mawsmai cave is a horizontal cave and a main attraction for tourists. Even aged people who can walk can come to visit it. After doing real caving this cave seems to be a joke for both of us. We took hardly 15 minutes to come out of the cave. It was around 8am when we finished all the tourist spots. We had given our next appointment to Gegry for vertical caving. Initially I was sceptic about one extra caving. 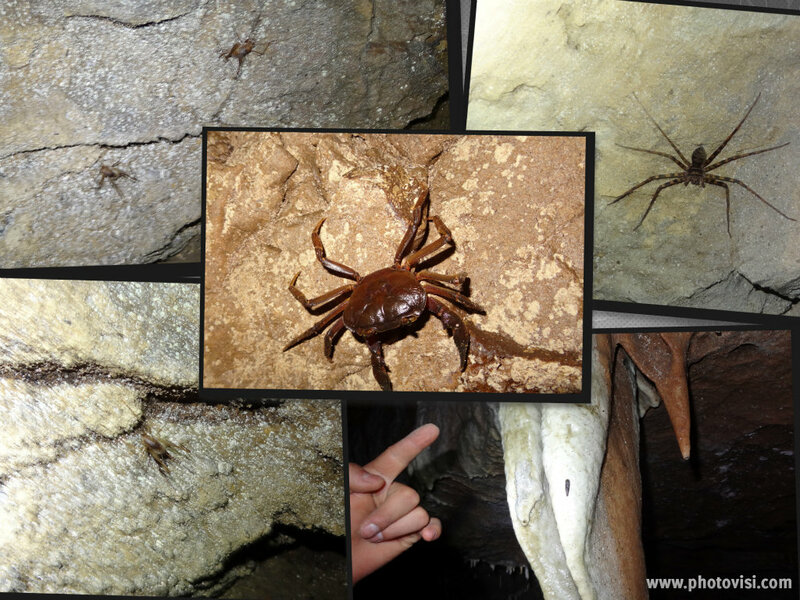 I thought why to waste money on other caving when we had already tasted the cave adventure the previous day. But since Rishi had planned it already, I didn’t say anything. But later I realize what I would have missed if I didn’t went for the caving that day. We reached back to our lodge around 9am, by that time Gegry already came to Sohra from Shillong. Good thing was he brought his car from Shillong because he needed to bring more equipment for vertical caving. Horizontal caving is of 1900 for two people and vertical caving is 2200 for two people, we gave him extra 500, because he needed to bring his car from Shillong. When we reached Sohra Plaza, our lodge, we took a quick breakfast and headed towards the cave. To our amazement we needed to go towards Kynrem fall. We stopped at Wahlong village and brought some mineral water bottle to carry inside the cave. Then we started descending towards the village. On our way we saw a church and a football field. We then took off trek path and travelled inside the thick forest for some 3-4 minutes before reaching the cave opening. We were standing in front of ‘Krem Riblai’ cave. Before going inside I was not sure what is the difference between Horizontal and vertical cave. While in horizontal cave we usually need to travel at same level, while in Vertical cave, we need to descend towards the lower level either by rock climbing or with the help of a cave ladder. then I thought it would be better to see what was troubling me lest I need to open my jacket inside dark cave. I undone my suit and slide my hand on my back. I felt a clumsy sticky stuff where my fingers touched the spot. There is one golden rule when you do adventure, never panic, because when you panic, you lose 83% of your thinking power, and do something bad. I then asked Gegry to look at what had stuck on my back. He told with a worried voice that it was a leech. A smile came on my face when I heard about leech. I open one canister and gave the camera to Gegry to take some snaps before removing the leech. After clicking some snaps Gegry removed the leech with the help of Pliers. We then saw blood on my vest. The leech was small and hence I was able to bear the pain. Anyway I was happy that adventure begins for me and I have some brave thing to write on my blog J.
and also we can see that there were two floors beneath us. It was bit cold and water was coming continuously from top. We could hear the brook sound from the bottom floor. My digital cam can’t capture that scene, firstly due to cold our body vapor was making the picture hazy and secondly that hall was so big, that the light was not reflecting back to camera, making it hard to capture good picture. I was in awe when I saw that site and first thing that came to my mind is, “Whither shall I go from Thy Spirit? Or whither shall I flee from Thy presence? If I shall ascend to Heaven, Thou art there. If I make my bed in the depths, behold, Thou art there”. We then started going down, within a few yards there was another descend of 10m, Rishi again went ahead. Though he was finding it bit difficult this time. I was just following what Gegry told, to climb down by putting pressure on legs only, and use hands to hold the ladder close to chest. to his waist. That descend was only 5m deep, so it was easy for Gegry to tow me down. Rishi followed me and then Gegry. We were in a long narrow gallery and the water was flowing beneath us so we need to put our legs on the side rock so our shoes won’t get drench. After walking 40-50m we found another 5m descend. This time the water was flowing from the top, which means we can’t climb down because we could get wet with chilled water. We decided to go back since we were already late, and we needed to leave Sohra before evening. But before leaving I thought to try some rock climbing and get to some distance down, which I did by climbing down. Then I went up, and we started going back. From the starting we had descended three times 15m, 10m and 5m. Now we need to ascend those ladders back to reach top. When we reached the first ascend of 5m, Gegry went first with the help of ladder and without safety rope. He then tied the rope in his waist and sent it to me so I could ascend. Now it was Rishi’s turn to come up but he was finding it hard to come up. He asked Gegry to come down to show him how to ascend which Gegry can’t do since he needs to hold the safety rope. After around 10 minutes of trying Gegry ask me to go down and help Rishi. I climbed down and help Rishi with some basic tips and a push from beneath to climbed up the ladders. When we came to 10m ladder, it was evident that Rishi was finding problematic to use the ladder. Anyway after getting some energy and waiting he climbed up. Now when we reached the final ladder of 15m we faced the worst problem of our trip. Rishi is a left footed football player and take adventures trip often. But when I saw him this time, he had put on some weight around his waist. Though no one can say he is fat, but his non-uniform distribution of fat, make the thing worse in that dark cave. After Gegry went up to the last ladder of 15m, it was Rishi’s turn to climb. And since he had climbed two ladders few minutes back, his hands were in fatigue state. Moreover, when he was trying to climb up, his body was getting away from the rope and thus he was not able to make the ladder close to his chest. Mathematically speaking it was becoming a triangle where his upper body, lower body and ladder are acting like three sides of a triangle. Instead it should have been like a parallel line consisting of straight ladder and straight body. In order to go up, he was using his hand instead of his leg, which eventually made his hand fatigue and when he loss all his hand’s strength, he came down and asked to wait for some minutes in order to relax his hand. One more problem he faced is due to small space in ladder’s steps. The Step’s space was so small that only one and half foot can come. The trick I told Rishi is not to keep the foot in flat position but instead to put the feet in slant position, i.e. 90 degree from the ground, and also to put only one foot in one step of the ladder. Twice Rishi went up to 3-4 steps and then return back; it took close to 45 minutes approx in that last ladder. He also asked Gegry to pull him up, which Gegry replied in negative, because he can’t lift Rishi up to 15m. Rishi then ask us to wait till the fatigue in his hand will be over. In mean time I tried to boast up his spirit, which is the only option we three had, since it was getting darker outside and chillier inside the cave. Gegry later told that he feared about hypothermia. had covered 25%, 50 %, 75%, in order to boost his spirit. He once totally loss the energy but then he just tried to rest on the hanging ladder, putting all his weight on Gegry since he knew that he can’t afford to come back down (where I was waiting like a hungry wolf to devour him J ). I was encouraging from beneath that he needs to do it, he already covered many steps. Finally Gegry and I breathed a sigh of relief when he reached the top. Then Gegry asked me to come and I followed Rishi. Gegry packed the entire ladder and put things inside the canister and then we moved towards the opening of the cave. First when we saw the opening, there was still some light in the sky, but when we reached the opening, it became dark and moon was in her full bloom. We went to the main road and there we changed our clothes. It was something near to 6pm. On our way to road, I bowed down in Church and thanks God for timely rescue. A month later when Rishi came to my home to take the trip snaps, he told me that he still gets nightmare of that cave hehehe. I feel those 30 minutes we spent in the cave together were the defining moment of our friendship. And neither of us will ever forget that incident. When we were coming with Gegry in morning, he asked us about our next day plan. When we told that we planning to go to “Mawlynnong”, He called the local person out there and booked for our stay. Around 7pm we reached our lodge and after having a quick dinner we started for Mawlynnong. For Mawlynnong we need to go back to Shillong’s route some 28km and then take the diversion for Mawlynnong which is 68km from there, i.e. 90km from Shillong and 96km from Sohra. When we started it was already 8:15pm and we thought we will reach by 10:30 something, because by then we did not know by what average speed we are going to drive. Also we did not plan to start so late, but since the plan was made up in the morning itself we thought to drive it and it won’t be late. And Gegry booking at right time helped us to take that decision, since reaching late at night would not be a problem because then we won’t need to search for a lodge. Also we planned that we can come back by 4:30 am and visit the ‘Nohkalikai Falls’ and then head towards ‘Mawlynnong village’. But because we got stuck inside the cave, we started two hour late from our schedule time. Moreover Gegry and the lodge owner didn’t say that it was risky to go at night. All these things was inclining us to take the decision. Initially Rishi was Ok with the idea of going, but then the series of some unfortunate events started. We first came across the thick fog which reduced our speed to 20kmph. Then we got to know that Rishi dropped his biking gloves somewhere in Sohra. He ordered those biking gloves for this trip only and it was obvious that he was getting frustrated, but along with that he was getting succumb to the feeling to revert to Sohra. But we had already covered 20km. I suggested Rishi to pull over near a village and make a call to Sohra Plaza owner to enquire about his gloves, but it was in vain. I then gave him my gloves to wear since he was driving and I will manage the cold by covering my hands inside my jacket. I also suggested him to put socks with his slippers as what I had done. Both our shoes were still wet because of caving. The village where we stopped was Mawjrong, we stopped our bike to change the socks, behind a parked truck. When we were almost done, one person approached us. He was of our height and average build. He introduced himself as ‘Baba’. He told that he is part of a group which is sort of a police, who take cares of the things if there is some problem in that area of 20-30 villages. He was very happy and amaze by seeing our adventure stint of going at that hour to a village in one bike to a totally unknown place, where people usually are xenophobic. He was kind enough to take our number and told that if we face any difficulty we could give him a call. That assurance by a stranger in a strange land just made us feel that we are important to them, as we are not just Tourist but their guest. We asked him that how safe is to go to the village at that hour, when we asked that question deep within I feared that if he would have said its risky, then we need to go back which I didn’t want. Personally speaking I always felt that if we decide something we should try to complete it as far as possible, and ofcourse I wait for signs. And the sign was favouring me to boast up Rishi’s courage to continue the journey, amazingly the thick fog soon disappeared and after diversion to Mawlynnong Road, we found the good road. Later we found a single lane road due to road widening project, but since it was night not much traffic was there. But some roads about 5-6 km near to Mawlynnong village was really horrible, the worst we had seen in whole trip. While sitting pillion, I was simply enjoying the chilled breeze with my monkey cap, while the bike cruise on the full moon night. But soon our patience started giving up, since it was taking longer than what we had expected. The various landmarks which Gegry and Baba had told us, were taking much time to arrive. Only good thing was that we were getting all the landmarks and it was not a hard task to find the route even though we did not find any human being on our way. Though one problem we faced when we were just about to reach the village. There was one diversion where the route sign was not mentioned and we end up going to a different village. But when we realize our mistake we need to come back all the way back towards Mawlynnong village. If there we would have found the milestone we could have safe some 45 min. We reached Mawlynnong village around 1pm. It was so quiet in the night. We didn’t know where we needed to go, and we end up in the village centre. We parked our bike and fortunately 3-4 men were coming from inside the village. We explained that were searching for the ‘Guest house’ but first they misunderstood us and tried to take us somewhere else but when we emphasised that we had already booked the Guest House, they took us to the Village guest house. The owner had left the hope that we would be coming by night and slept by 11pm. On seeing us he opened one of the bamboo huts in half drowsy state. I was hungry since we had not taken much in Sohra. I ate some dry fruits and biscuits and then went to our cozy bed. The mosquito net and blanket was provided to us. I woke up late this time, around 7:30 since we slept late at night. While Rishi was still asleep I tried to freshen up. I did shaving which was pending for long time. I could hear children chuckle from down the path where our bamboo hut was placed. I realized that there is a small brook flowing beneath the valley. I then went to one of the Machan, High Platform, which was attached to our hut. It was a serene feeling to hear the sound of music which was generating from the brook, breeze and birds chirping. The inn keeper then came to me and asks that would I like to have breakfast in the hut itself or will go to the restaurant. I chose to walk and go to the restaurant. After walking some 20 yards, I came across a house which was the restaurant. It was a well maintain home, and they kept it clean. It was like I came to visit one family. we saw near Double Decker bridge in Sohra. This sort of technique which is followed in village makes us amazed that how they enjoyed their life even if they don’t have facilities of Refrigerator and Microwave. In the morning when the inn keeper came I asked him that what is special in this village. He instead of replying with facts, humbly told us to take a round of the village, and we will know ourselves. I ask how the village got the title ‘Asia’s cleanest village’. He told Mawlynnong became famous with sheer mouth to mouth advertisement, when people use to come here (which is like 90km from main city) for visit they return with the memories and share their experience to their friends and then they start coming. This way the village name was able to make his place in World Map. I don’t know that how many Indian will be able to successfully show Meghalaya in India Map, but they will definitely have a mixed feeling that Asia’s cleanest village is in India which make them proud, and then they will be little dismay that it is somewhere in North-eastern state, which is an ignored state and still considered a foreign country for many. After having breakfast we walked around the village and then we realized that why it is called the cleanest village in Asia. Before coming to Mawlynnong, I was thinking that it would be a Green village which will not have plastic or polythene. And the local people keep the village tidy and clean with their bloom and all. I was just taking it as a personal challenge to find polythene or something. But when we saw the beauty of the village, we were awestruck. It was not about the tidiness or polythene bag, but it is much beyond what a city boy can never think of in his dream. The village is full of garden. 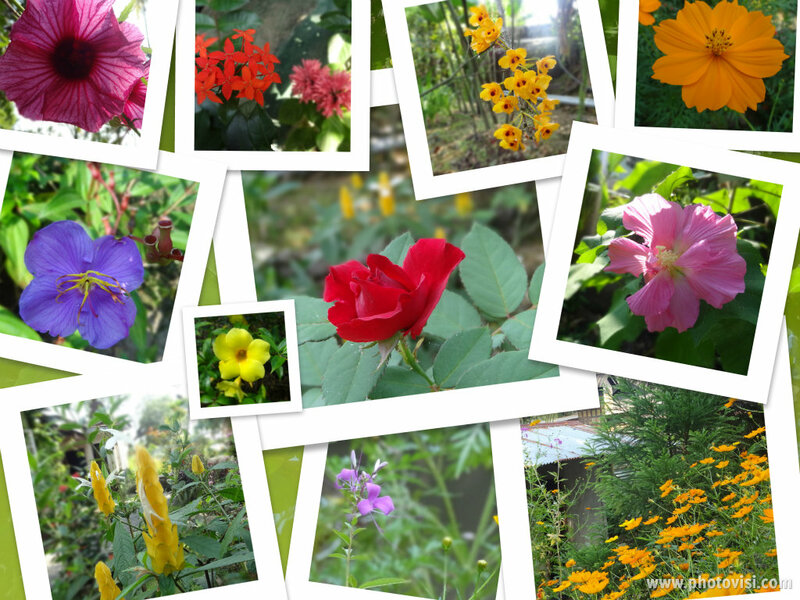 It was really hard to say that village is full of garden or the village is situated in the middle of a big garden. Thing which was hard to understand was where the city people don’t like to waste money on small flowers and plants how people from a village maintain a nice garden, that too not a kitchen garden but a well maintained decorative garden. We know villager’s main occupation is farming but villagers are not interested in bringing up the whole garden in their backyard. You might be able to find one or two flower but whole garden and that too not in just four or five houses in the village but every house maintained a beautiful garden. I wasted no time taking picture from my new camera in background de-focusing mode. We saw various colours of flower but the best was the pitcher plant which was planted in one of the home. Pitcher plants are carnivorous plants and eat insects, though they are amazingly beautiful. There were two churches in that small village one is Presbyterian Church (it was renovating) and CNI Church which was at the entrance of village and was just situated ahead of our village guest house. It was a beautiful Church with a beautiful garden. Though I was bit disappointed with some cobwebs, but it was fine to some extent, after all the village was not clean by Tourism Ministry. Infact it was good to come to the village without entry fees and not via paying Ticket and all, which would have corrupted the whole innocence of the village and the villagers. When we came back to our room, the inn-keeper came told that he arrangeed a guide for us to visit some nearby points. The guide name was Alex, and he works in the guest house. He later told that he came here to take training and once he completed his training he will go to Orchid Resort in Umiam Lake, the resort which is in Guwahati- Shillong route. Our first stop was ‘Sky View point’, which was nothing but a Machan (High platform) of some three-four floor heights and was built up of bamboos. There was nothing much to see since we already saw Bangladesh from so many view point. (Yes, Mawlynnong is near to Bangladesh border). Our next stop was a Natural Balancing rock; there we saw a big rock perfectly balanced on the small rock. And I must say that the balance was just like Fevicol gum, since we could see many names on that rock which was happily inscribed by our dear sweet tourists from our own India. Thus if the two rocks were not strongly balanced, the rock would have tumbled down when people tried to write their names on the rock. Our next and last stop was Rawai village’s Living root bridge. And then one funny incident happened. Due to our hectic walking in the double-decker bridge, horizontal and then vertical cave, I had pain on my thighs, which was making me to walk sideways, especially on stairs climbing. When we started climbing down to go to living-root-bridge, one of the tourist told that if I have sprain I should not go down, there are total 500 stepsJ. Rishi and I have no other options then to pass smile and to ignore the advice. Rawai Living-root Bridge was good to be visited by normal tourists, who are not much into trekking. Infact we saw many aged people going down and watching the living-root bridge. So if you can’t trek and see living-root Bridge in Cherrapunji, you have one more reason to come to Mawlynnong village. When we reach the living Root Bridge, we saw many tourists, unlike the situation we had faced in the other visited tourists spots from past three days. This bridge was wider than the other bridges. I felt even Bike or bicycle can pass through the bridge. We saw some local kids bathing in the stream. It is a joy to see kids enjoying which reminded us of what we had missed as urban city lads. After those three spots we returned to the Guest house and waited for lunch to get ready. In mean time we packed our luggage for Shillong. We had rice, dal, plain potato, small chicken gravy and a very spicy tomato Chutney. We left Mawlynnong around 2:30pm; it was a very short stay in that beautiful village but in actual we didn’t have the luxury to stay there for longer time, otherwise it was 2 days and one night destination. On our way back to Shillong we saw the villagers (read humans) which we had missed before while coming to Mawlynnong in the moon light. We saw that in every village there is a church. We also saw the cloud flowing from one end of the road to the other, as if they are just crossing the road as any other Pedestrian pass the road. We reach Shillong around 5:30 pm and went to Police Bazaar to find a lodge to stay. Since the vacation season was almost over we did not face much problem in finding cheap room. We chose Police bazaar this time because it was the city main market centre. We roam a bit and then had dinner in one Bengali restaurant and then went to room to take some sleep. Coming back to city is good in two ways, first you have access to technology and second you will start getting News of the outer world. 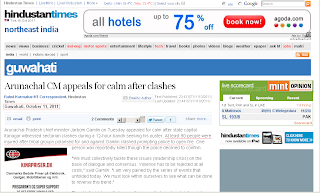 When we woke up in the morning and switched on the Television set, we found that riot broke out in Itanagar, capital of Arunachal Pradesh. Itanagar was part of our actual itinerary for Arunachal Pradesh. I thanked God for blessing us in disguise. If we had my bike on time, we both would have continued with our plans and which would have ended up in some real-life adventures and violenceJ. From the last few days I and Rishi were having discussion on trip itinerary. Rishi wanted me to go along with him to visit Mawphlang village and some places in Jaintia hills in Meghalaya. But since I did not know the whereabouts of my bike I decided to go to Guwahati and try fixing things up before weekend. Also I was bit frustrated because I wasted money on my bike which never came and I don’t know it is in which part of the country. Although, if there would be some adventure activities. I would have definitely stayed back. Infact we also tried contacting Adventure group in Dawki, Meghalaya, where river canoeing being done, but due to raised water level, it was stopped for some weeks. find whole North east in those seven floor. And if you reach to top floor you can see the short movie on North eastern eight states, seven sisters and one brother. By the way, camera ticket cost 100/- but it was worth taking it. At ground floor we can take some souvenir for our near and dear ones. By the way, for India it been said that at every 500 km Language changes, but for North-Eastern state, for every 50 km Language changes, this much diverse is the North-East. We came back around noon to our lodge. We did some shopping in Police Bazaar and Bada Bazaar. I took a Chinese wall fan for my home. It has a painting on the semi-circle fan which was made up of bamboo. Rishi took Messi’s sport jersey. We went to Govt of Tourism office which is in Police Bazaar, where Rishi enquired about the places he could visit after I leave for Guwahati. There in newspaper I read the list of celebrities who attended someone funeral. Upon further reading, I got to know that Jagjit Singh passed away on 10th October at 70 years of age. It was sad to hear about him, his hits like, “Tum Itna Jo Muskura Rahe Ho", "Hosh Walon Ko" and "Chhitti Na Koi Sandesh" are some of the good gazaal every Indian grown up hearing. Someone updated in Facebook that ‘God get bored with Apple Ipod, so He now wishes to enjoy gazaal on it’. Truly departure of Steve Job and Jagit Singh in a very short interval of time was a setback for many fans. We had dinner in one Bengali Restaurant. One thing I notice about Police bazaar square is that it had nine roads connected to it. Alternatively, Police Bazaar square is also called ‘Khyndai laad’ in local language, where Khyndai signify Nine. We had some momos, which were available in very cheap rates. I woke up early at 6:00 am, and bid Rishi wishes for his later journey and went to Police Bazaar square which was some five minutes walk from our lodge. Sumo driver approached me and I got into his Sumo which was already occupied by other eight commuters. The taxies were also available, but I opt for Sumo, since I was in no hurry to reach Guwahati. The driver charged 150 Rs per head. I got the seat at last row, and the driver is waiting for one more passenger to occupy the last vacant space beside me. I was wondering that I was travelling in Shillong-Guwahati (NH 40) route for the 4th time. After waiting for some time a guy of my age came and sat beside me. Later I got to know he is a frequent commuter and need to commute in different part of North east, especially in Guwahati-Shillong highway. His name was Siddhartha Phukan and lives in Guwahati. Within no time our conversation reaches a level where we seldom sat quiet for more than 30 sec in that three hour journey. As he is a frequent commuter, he told the risk of driving in that Nation Highway 40. Also frequent traffic jammed every day make things worse. The highway is the main route to southern North-Eastern state i.e. Manipur, Silchar and even Mizoram (NH 44), therefore most of the truck travel in high speed in those curve hilly roads. Even that very day we saw three – four accident site on our way to Guwahati. Our topic went to Kaziranga national park, which is in Assam, he told about his experience from there, that how in one of his journey in rainy season Rhinoceroses came on the main road. We also discussed about History and political changes in North-East. In mean time our sumo stops at Nongpoh for tea and snack. We had Chole-bature, which was decent. Siddhartha gave the bill, even though I tried to stop him, but he didn’t listen. I tried to share chocolate with him, but he did not accept since he is not use to it. Well I need to experience one of the common traits we Indian follow, ‘Atithi Devo Bava’. I tried to do the same in many occasion and today I was in the receiving end. After having our snacks, we started again for Guwahati, it took some half hour to reach six-mile, where I drop down and the Sumo went ahead to Railway station. After a walk I went to Brahmaputra Lodge where we left our luggage. I book a single bed and took shower. Then I went to AFL Mover and Packer, there I got to know the same sad news that my bike has not yet reached. Though the manager was kind enough to re-book my bike back to Bangalore, I wrote an application and handed to him. (Strangely bike took 10 day to reach back to Bangalore from Guwahati). When I came out from the Mover and Packers, I went to Srimanta Sankaradeva Kalakshetra, which is opposite to Mover and Packer warehouse. It is an Assamese cultural museum along with some Institute. It was a university decorated with Assamese cultural, Science Park, Sound & Light show, Children’s Park, some good garden and open theatre. But since I was alone and had seen much better things in the past few days, I was feeling bit tired to roam around. Siddhartha told me about the Kamakhya temple, but I was feeling bored and tired to go all alone to see any tourist spot. Next day I took my flight back to my dark screen of Mainframe (read flight back to my coding life). This was the most incredible journey I had till now. We planned a lot for something else, but since we were an unexplored land, our journey turned good with lots of unique experience, which we might not get in our planned trip. First, I want to thanks Govt of India, tourism ministry. Initially I was reluctant to enter into Govt of Tourism office in M.G. Road in Bangalore. But when I entered and told my plans about going to Arunachal Pradesh, they welcome me with a smile and gave me North east tourism free brochure, maps and books. When I came out of the office, I carried a contented smile with me, and I was proud that first time I was benefited by Govt directly. I was then proud to be a Taxpayer. Mr. Naren Deka, who is the manager in Assam tourism office in Guwahati, was another Government official I am thankful of. He was our first official person with whom we interacted for getting Inner Line Permit (ILP) pass for Arunachal Pradesh, though we were not able to meet him, but his comforting word and assurance is enough for the tourist. Moreover he could have easily given me reference to Arunachal Tourism being an Assam tourism official, but he showed that he believe in ‘Incredible India’ motive from the core and boundary does not matter. Men, Gegry and Denis Rayen are other people whose life touch you to listen to your heart and chase your dreams. While Rajiv Sharma, Baba and Siddhartha Phukan, will inspire you to press on ‘Atithi devo bava’ towards a complete stranger. Many thanks to Rishi, without him this trip would not have been possible. I remember when we started planning the trip, other friends back out saying the location is dangerous, it is very far and biking there is risky. Even when I was upset that my bike did not come; he didn’t lose the focus of the trip and kept the trip alive throughout with various adventures. (Often I dreamed that I am sitting pillion on his bike and he is driving. I think the dreams will continue for some more months,) unless we planned one more trip where we both will drive our own bikes J. Thanks to Kari, he was our first point of contact whenever we needed something, whether asking for lodge, restaurant or places to visit, etc. I remember the way he brought two blank sheets in our hotel, which shows he pre-planned and came to tell us all exciting things about Meghalaya. Even before when I alone came to stay for one day, he was very passionate in answering my small queries and explaining about the Khasi traditional system. Without his inputs, I could not has written the travelogue in such detailed way. There are many thing for which this trip will be remembered, it is my first long distance trip, first one with bike for 900km (though it did not happen as intended) , done caving, watch living-bridge, which we heard in TV and magazines only , visited Cherrapunji, the place for the 2nd highest rainfall (highest rainfall is now Mawsynram) which we read in school textbook and visited Asia’s cleanest village, I never in my dreams had thought that I would ever be able to go there and that too find the village as beautiful as I heard about. Meghalaya, the abode of Cloud. Climbing ladder in Riblai vertical cave.